Thirty films will unreel at the 2014 edition of Elliot Lavine’s I Wake Up Dreaming noir film festival, a staple since 1990 at San Francisco’s Roxie Theater. During the festival’s 10-day run—Friday, May 16-Sunday, May 25—Lavine promises “a spectrum of pre-code crime, proto-noir, full-on film noir, and even a smattering of post-noir.” He will announce the full lineup and screen 1948’s The Argyle Secrets, a rarity not seen on the big screen locally in nearly seven decades, at the Roxie’s first ever I Wake Up Dreaming benefit on Wednesday, March 26. The Roxie event promises to be a memorable evening that will also include an auction of vintage noir memorabilia; the unveiling of the 2014 I Wake Up Dreaming poster, featuring the work of artist Mark Stock, who will be on hand to sign posters; a screening of Rudolph Maté’s 1949 classic D.O.A. ; and free liquor. The evening’s highlight, Cy Endfield’s The Argyle Secrets, stars William Gargan as a reporter implicated in murder and on the hunt for an album, made distinctive by its argyle cover, that contains the names of American Nazi collaborators. All money raised at the benefit will go toward supporting the nonprofit Roxie’s repertory programming. Tickets for the first ever I Wake Up Dreaming benefit are $25. The event begins at 7pm with entertainment, the auction, poster signings and refreshments. 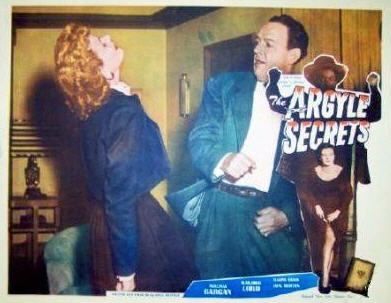 The Argyle Secrets screens at 8pm, followed by D.O.A. At 9:30. For more information, call the Roxie at 415-431-3611 or Elliot Lavine at 510-482-1659.